The pearl of the Mediterranean, the island of Sardinia is the most peculiar region of Italy. Sardinia was included in the Kingdom of Italy in 1861, but to this day most of the islanders do not consider themselves Italian. For many reasons, the island's aboriginals were in constant conflict with the mainland part of Italy. Many years of disagreement subsided in 1948, when Sardinia gained the status of an autonomous region. The indigenous inhabitants of the island, the descendants of the ancient civilization of the Nuraghs, have for centuries lived under the cultural and economic influence of the conquerors from Phenicia, Carthage, Rome, Spain, the Savoy dynasty, and others. On the island of Sardinia there are more than 250 beaches, among which a considerable part - beaches with white sand; their total length is about 2000 km, so Sardinia is the best place for a comfortable beach holiday - even with a large number of tourists, the beaches never seem crowded due to their truly huge size, and the beauty and purity of the Sardinian beaches and the sea can be compared to the beaches in the Maldives . Costa Smeralda, a 55 km long bay in the northern part of the island - one of the most prestigious coasts of the island of Sardinia, the center of exclusive beach tourism. The name of the coast comes from the unusually saturated emerald color of the sea water (smeraldo - emerald in Italian). Costa Smeralda - a favorite place for a beach holiday of the world's richest people. The largest center of the coast is the port of Porto Cervo. Attracted by the solitude and extraordinary beauty of the beaches of the Costa Smeralda, covered with fine-grained white sand, the Arab prince, multimillionaire Karim Aga Khan IV, in 1961 decided to implement the project of arrangement of North Sardinia as a "reservation for millionaires" by constructing the resort of Porto Cervo. Under individual projects of fashionable architects, elite settlements with exclusive golf clubs, wharves for luxury yachts, private airfields and helicopter platforms were built here. Here, on the Costa Smeralda, we held our symbolic wedding ceremony and a photoset for a beautiful couple in love. 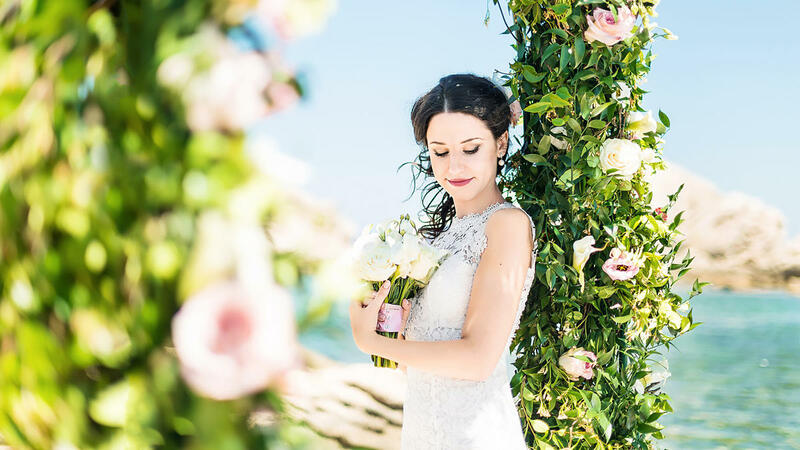 The newlyweds settled in the coastal hotel, where we spent the morning of the bride, preparing a tender image for her, and we arranged a ceremony for our couple right on the beach, with a beautiful flower arch, with a light aperitif and prosecco. After the ceremony, I continued the photo session for the young ones, and, despite the scorching midday sun, our photoset was a success.